Mount Pleasant Middle School has received a $5,000 grant to establish a Garden Lab and Student Center adjacent to its butterfly garden and hummingbird habitat. The middle school was among 1,000 schools and parent organizations to receive a Lowe’s Toolbox for Education grant in 2007-08, given to school improvement projects. The outdoor classroom, which will consist of a patio, outdoor tables and seating to accommodate about 30 students, will be in the shade of three large trees adjacent to the garden. Principal Sam Treadaway said the project would be of great value to students as they study the natural world. Worthington Direct offers great products for outdoor use by Ultra-Play and Southern Aluminum. Outdoor tables and benches are available in a variety of colors and can stand up to the harshest of climates. When bad weather occurs, students can continue learning about science indoors with Science tables and stools from NPS, Inwood and Allied Plastics. 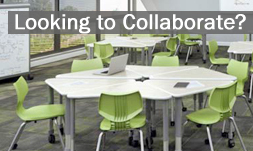 Visit www.worthingtondirect.com today for all of you school furniture needs.